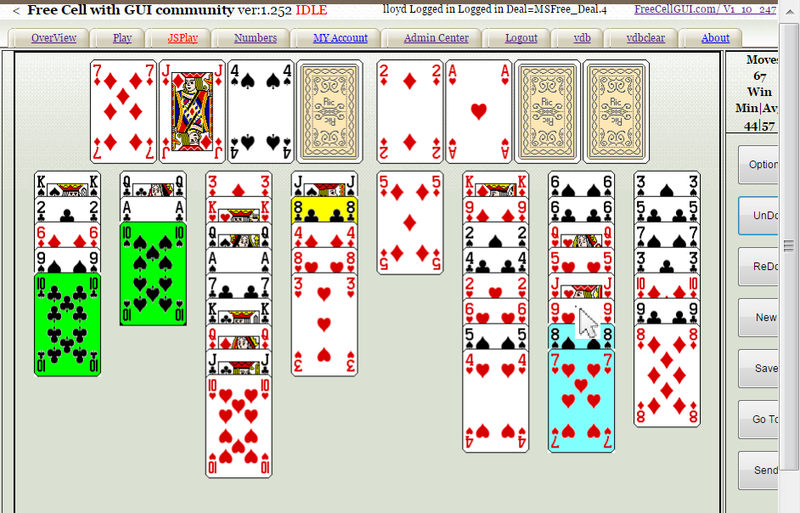 The purpose of this site is to enhance the experience of playing FreeCell Solitaire by establishing an environment that collects, records, and reports statistics about the deal , Challenge , and User, recognition of achievements and an implementation that provides a Graphical User Interface (JSFreeCell) to assist with the mechanics of playing. Try JSFreeCell NOW for 20 days free. Join the Free Cell GUI Community NOW for $9.99 a year. Since almost all FreeCell deals are winnable the emphasis of the site is quality of play, solving deals with the minimum number of moves, and head to head competition by having daily challenges where everybody that participate play the same games with a measurement that mitigate the effects of quantity. A Challenge is a named set of Freecell deals numbered from 1..n. Winning or loosing a deal of a Challenge is recorded and reported on this site (see Statistics ). All users playing a Challenge play the same deals. Only when a user has played all deals less than the current highest numerical deal is the highest deal incremented. This facilitates the comparison of their results and measuring the skill of the user. There are two types of challenges, never ending and ones that have a starting and ending time (Pacific Time, GMT-8). When ending time occurs the recording of statistics stops. There are two never ending Challenges, "MSFree_Deal" and "JFreeCell_Deal". MSFree_Deal games are identical to the deals of Microsoft's Freecell. Supplied for those users who are interested in particular deals. Like unwinnable deal 11982 and difficult deals (169, 178, 258, 454, 617, 718, etc). The second is "JFreeCell_Deal". 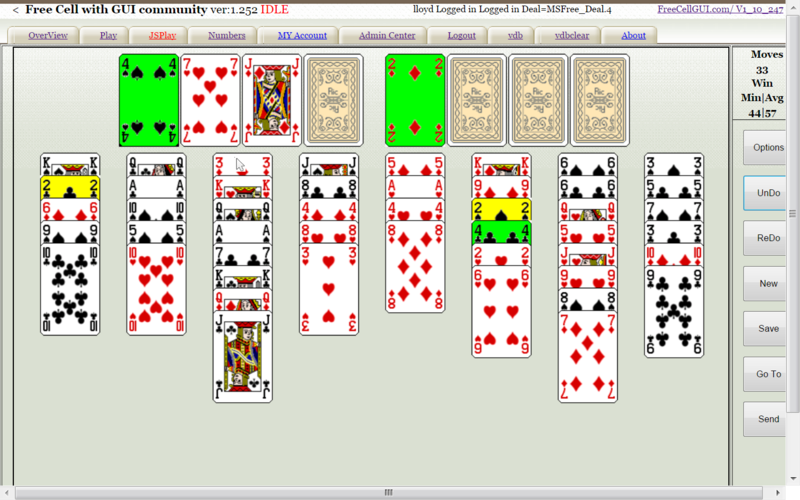 The native deal algorithem of the GUI FreeCell implementation. The timed Challenges are a daily challenge, a new one created every day. Supplied to provide a short term competition. Daily challenges are removed after five days. The statistics accumulated by a user playing Daily challenges remain until the user fails to renew membership. The Challenges are displayed by clicking the Numbers tab and then clicking "Challenges" in the left hand column. Challenges are selected by clicking the Option Button on the JSPlay Page and selecting one of the three radio buttons..
JSFreeCell can theoretically deal 9.22E+018 different games. If 100 games a minute were played it would take 1.75E+011 years to play all the games. Thus, though possible that some deals will be duplicated between Challenges it is not very probable and no checks have been made to detect or prevent. To play JSFreeCell you must be a registered user. Registration requires a User Name to be used to report your statistics and achievements , password to secure the right to record statistics under your User Name, and an Email Address which is used to send you a new password, if you forget your current password, and to notify you of successful registration and other communication about your account. Both the User Name and Email Address are case insensitive, but the Email Address, when reentered to authorize lost password recovery, is case sensitive and must be entered exactly as it was entered when Registering or Editing Account. Your email address is the only personal information maintained by this site (see privacy statement) and it and your password will never be intentionally exposed or shared with anybody. If you are concerned use a email address that is disposable (one created for this purpose only). To use the GUI functions and statistic recording beyond the free 20 day trial you must become a Member of the FreeCellGUI Community. One month after trial, or two months after membership, expires the user and all of the users statistics will be removed. If membership is renewed or acquired before grace period elapses the statistics will be retained. 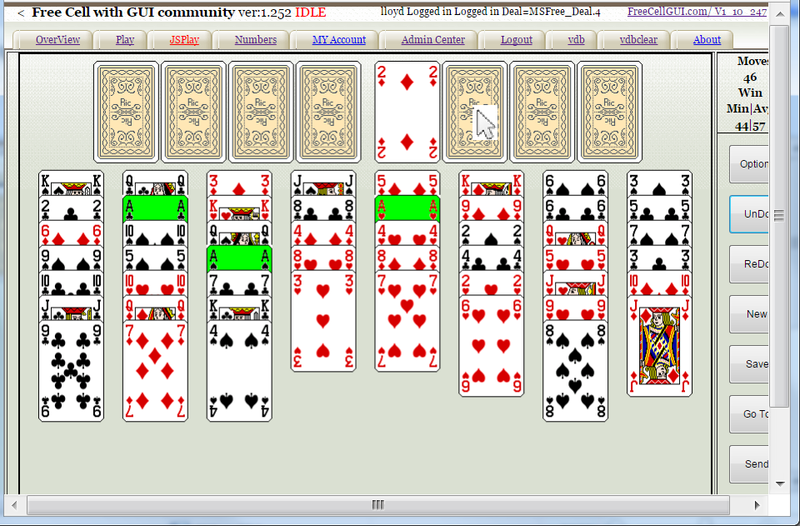 FreeCellGUi collects statistics about User play, Challenge , and individual deals of a Challenge. All the statistics collected are gathered when a deal is won or lost. The deal statistics are the basic statistics that are collected. Challenge statistics roll up the Deal statistics at the Challenge level. The User statisitcs roll up both Deal and Challenge statistics. Statistics are reported in two ways. Through your browser on the Numbers tab and in the statistics window displayed by Selecting the Opttions Button on the JSPlay Tab and selectig Deal & Users statistics check box. . The individual statistics are defined here. The statistic reporting fields have tips that popup whenever the mouse moves over a displayed column header or field as appropriate. The "Tips" are repeated here along with additional information if needed. 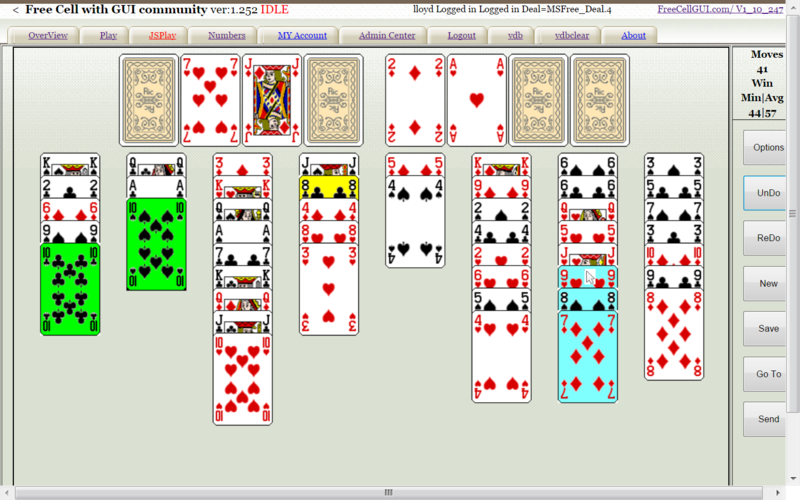 A move is counted whenever a user triggers the movement of one or more cards with a left click of the mouse or a touch. Automatic movement to Home (AutoUp) and UnDoing, and ReDoing do not modify the move count. So it is possible that there are deals that could have a win_min_moves of zero. In the left to right order of the columns in "Numbers/MSFree_Deal" with the titles being the same as the column headers. Tip:=The number of times a deal has been won. Also is the number of users that have won this deal. A deal can only be won once by a user. Replaying a won game has no effect on the statistics that were set when the deal was won. Tip:=The number of times a deal has been lost. Though loss is a misnomer because a deal is counted as a loss when the deal is abandoned by starting another deal. But a user can return to the lost game any number of times and abandon it again and again, and it will only be counted as one loss. If on returning the game is won, the loss is converted to a win. Tip:=The average number of moves used to win a deal in a Challenge or Deal. While not displayed, the total moves used by all users to win this deal is recorded and it is divided by the number of wins to compute this average. Tip:=Minimum number of moves used to win this deal. Tip:=Number players who currently are playing this deal. In the left to right order of the columns in "Numbers/Challenges" with the titles being the same as the column headers. Tip:=Highest deal played in this Challenge. The most deals played by at least one user in this Challenge. For timed Challenges only, to increment the highest_game_played a user must have played all deals <= highest_game_played'. Tip:=The total number of deals that have been won. The total number of deals that have been won in this challenge. Tip:=The number of deals that have been declared as losses. The total number of deals currently declared lost in this challenge. The total number of moves used to win deals in this challenge divided by "wins". Tip:=Best Proficiency ((win_moves + 500 * losses) / wins) achieved by a user in this challenge. When a user wins a deal, JSFreeCell calculates the users proficiency on this challenge and it is recorded if it is lower than the current value of best_proficiency . A loss is counted as 500 to discourage users interested in having a good proficiency from just quitting hard games without even trying. Tip:=User that has the best efficiency. Tip:=Longest streak of Wins achieved by a User in this Challenge. The most consecutive wins without a loss achieved by single user. Tip:=User that had the Longest Streak in this Challenge . Tip:=Most wins by a User. The most total wins by a user in this challenge. Tip:=User that has most wins. Tip:=Number players who currently have the Challenge selected. Tip:=Date_Time this Challenge was created. Permanent challenges do not have a start time. Tip:=Date_Time this Challenge will be/was Closed. Permanent challenges do not have a end time. In the left to right order of the columns in "Numbers/Members" with the titles being the same as the column headers. Total number of deals won by this user in all challenges played. The total number of deals currently declared as lost by this user. Tip:=A measure playing quality (win_moves + 500 * losses) / wins. Lower is better. This is the current proficiency of the user. Tip:=Max number of consecutive wins achieved by a User. The number of consecutive wins across all challenges without a loss in any challenge. Tip:=Count of the number of wins with fewest moves in all challenges played by a User. Total number of min_moves_cnt won by this user in all challenges. Tip:=Count of Best_Proficiency in all challenges played by a User. Tip:=Total Count of Streak_max in all challenges played by a User. Tip:=Count of the number of Challenges this User is the Max_wins_a_User. The statistics are displayed in the statistic window. See Figure 7. Figure 7. JSFreeCell Stats Window. The window shows data that is displayed in Deal Statistics and Challenge Statistics. The Deal stats are on the left of the "|" divider and the Challenge Stats on the right in applicable fields. The fields have "Tips" that gives explanation of the values. 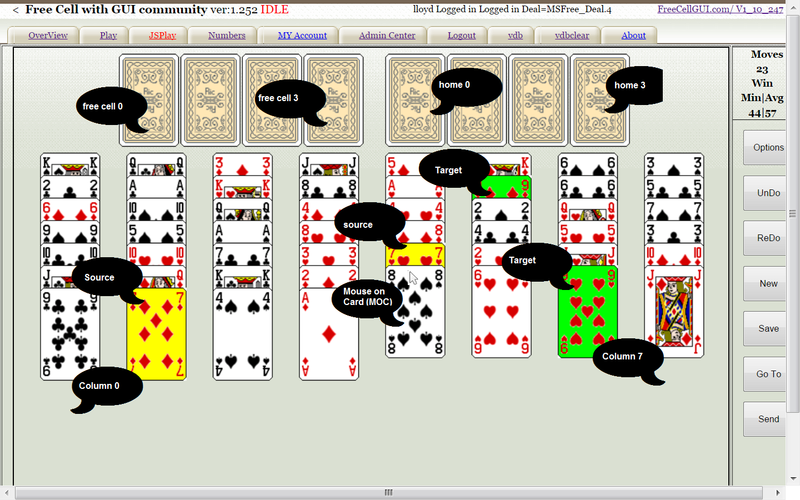 Column labeled "Session" refers to the deals that were played since this instance of JSFreeCell was started. 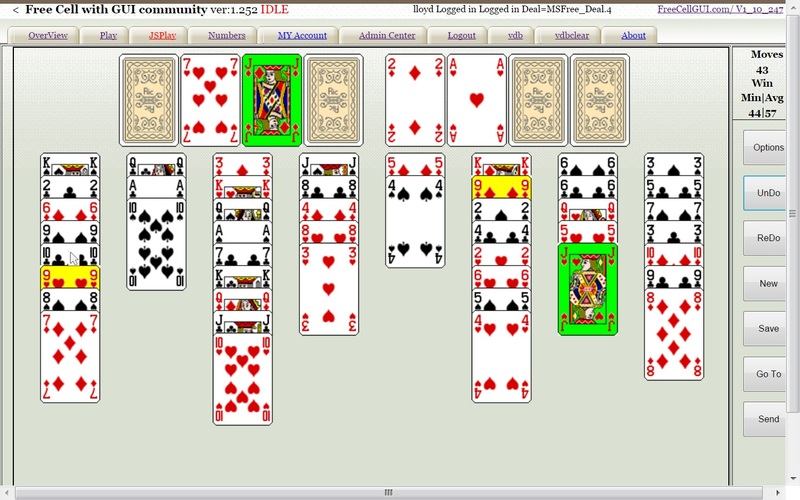 The Graphical User Interface consists of functions to assist in locating cards and moving cards . For touch devices the blue ball is the equivilent of the mouse pointer and touching isking. When the mouse is on a card (MOC) the cards that are a target (cards that MOC can be played on) an for which MOC is a target (source, cards that can be moved to MOC) are highlighted with colors. Green for target cards and yellow for source cards. When mouse is move over an empty Home cell all the Aces that are not in Home are colored green. See Figures 0 , 1, and 2. If Ctrl is pressed all the cards of the same rank as MOC are colored green. These functions assist in planning moves. When a card with a valid target is left clicked on it is moved to the target card that is, in priority order, the farthest right, a empty free cell, empty column, or Home. In the case where there are two or more valid targets the card can be moved to the desired target by selecting it (right click, or shift + left click) (on a touch device, touching the card and hoding still for .3 of a second emulates the right click) then left clicking on the desired target. Selected cards are colored blue and remain selected until a valid card is left clicked on or another left click on any selectable area (eg not Home). See Figure 3. and Figure 4. The preceeding move function applies to multiple cards (descending rank and alternating colors) with one difference, when there are more cards than it is possible to move then only the ones that can be moved are selected and colored blue. See Figure 5. If there is a empty column the number of cards that are selectable is the number of cards that can be moved assuming the valid target is not the empty column. For a discussion of maximum cards that can be moved, see maximum cards . Cards are automatically moved to Home (AutoUp) when there target is in Home and they are not the target of any card that is not in Home. In Figure 0 the Ace an Two of Diamonds meet this criteria and were immediately moved to Home. See Figure 1 . Definition of Buttons that when clicked evoke the described response. Click to hide show options page that contains Check Boxes and Radio Button that, when selected, modify the behavior of JSFreecell. If checked the Statistic Page is displayed. See JSFreeCell Statistics. If checked an audible signal (beep) will be emitted to alert the player that specific events have occurred. A card being moved to Home; When a card is selected and left click on a invalid location or a deal is just won. A pair of radio buttons to select whether to use Mouse or Touch as the card selection method. Neccessry for devices that have both mechanisems, or the method is not detected because inactivity of user. if Autoplay and Daily Chalenge are checked, means automatically play the current day challenge any time it is found to be a new day. Three radio Buttons to select what Challenge is to be dealt. If selected the Daily Challenge for the today will be dealt. If selected the MSFree Challenge will be dealt. If selected the JFreeCell Chalenge will be dealt. Clicking the UnDo button returns the tableau to the state it was prior to last move action. continue to click the UnDo button and eventualy the tableau will be returned to the dealt state of the current game. Undo's the last UnDo (e.g. returns the tableau to the state it was prior to last UnDo). Any action other than an UnDo removes the ability ReDo any UnDo's that were eligible for ReDoing. Clicking the redo multiple time will return the tableau to the state prior to the last UnDo. Triggers the dealing of the next highest game that has not been playe. If the current game has not been Won a dialog will ask for permission to declare the game as lost. If clicked the state of the current game will be saved. Clicking Go To will display a dialog to allow you to specify the game in current challenge to be played. The default value is 1 greater than the last game that was played. 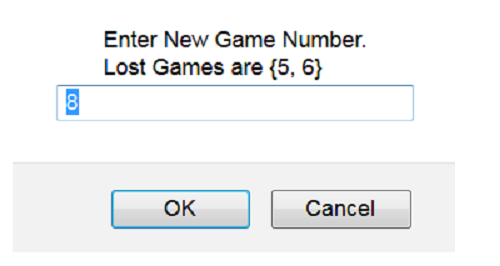 A list of lost game number is shown in the dialog to aid in replaying lost games. The specified game number must be lower than the highest game played (for daily chalenges). Click Send to try to send any transactions that have been queued because of the loss of connection to the internet.